Flush mounted light fixtures are the most maligned light fixtures of all fixtures. They have earned their reputation because of all the bad flush-mounts out there in the lighting universe. Guess what – there are some really attractive flush-mounts available and they are absolutely needed in lots of applications. In certain applications, when you do not want to make a decorating statement, there are really plain vanilla flush-mounts that just sort of disappear on a white ceiling. Flush-mount do not have to be ugly! Dispense with any preconceived notions about flush mounted fixtures and welcome them into your home. You do not have to be ashamed to say you have a flush-mount in your front hall! Because they illuminate with little downward obtrusion, flush mounted fixtures are ideal for providing ambient light in high traffic areas, such as hallways. They can also work well as a centerpiece when a lower hanging fixture would interfere with views or flow, especially when ceiling height is limited. 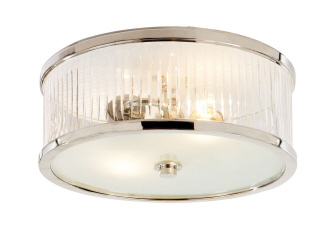 I like using a flush mounted center ceiling fixture in bedrooms, usually a plain white one. Closets and laundry rooms are other areas where a flush-mounts are ideal. Outside porches, bathrooms and even showers are opportunities for using flush mounted fixtures, provided they have either damp or wet location ratings. Let your imagination be your guide.